Daniel Rubin and Chris Langlois, two attorneys at the Girvin & Ferlazzo law firm, host this week’s episode of the Girvin & Ferlazzo radio show, airing Saturday mornings on Talk 1300. Daniel and Chris fielded all sorts of legal questions from the Albany community in this episode, with caller topics ranging from advanced Medicaid planning to eminent domain claims. As attorneys at Girvin & Ferlazzo, a full-service law firm in the Capital district, Daniel and Chris both have a broad litigation background. Daniel’s areas of practice include personal injury law, medical malpractice, and civil litigation. Chris practices in similar fields of law, and he also has experience representing municipal clients such as town, counties, and school districts. While Daniel clearly has a legal skillset, he might also have a chance at a career in linguistics, as he identified that Chris’s last name, Langlois, might indeed be French for “lawyer.” (We checked, and the translation is actually “avocat,” but “loi” does translate to “law,” so Daniel was close!). Dave from Albany called in with the first of two caller questions about car warranties and rental cars. He explains to Daniel and Chris that he recently went to get service done on his vehicle, still under warranty, and the dealership said it would take at least one month for repair. Dave poses the question as to whether the car dealership has a legal obligation to provide him a rental car. As with many types of litigation, the legal issue at hand really goes back to the contract. The attorneys suggest that Dave look at the warranty itself to see if it specifically addresses rental cars. Usually in a warranty, there will be a specific clause that says whether you are entitled to a rental car or not. Additionally, Daniel brings up the concept of “measure of damages,” a contract law term relevant to this scenario. To establish measure of damages, someone in Dave’s situation might want to rent a car to establish an out-of-pocket loss. Interestingly, Daniel adds that contracts are not the only source of action in this scenario – The Court of Public Opinion also holds tremendous power, potentially even more so than litigation in this case. In our increasingly virtual world, online reviews garner attention from the company and other consumers alike. To avoid a tarnished reputation, companies might work with you directly to earn a more favorable review. 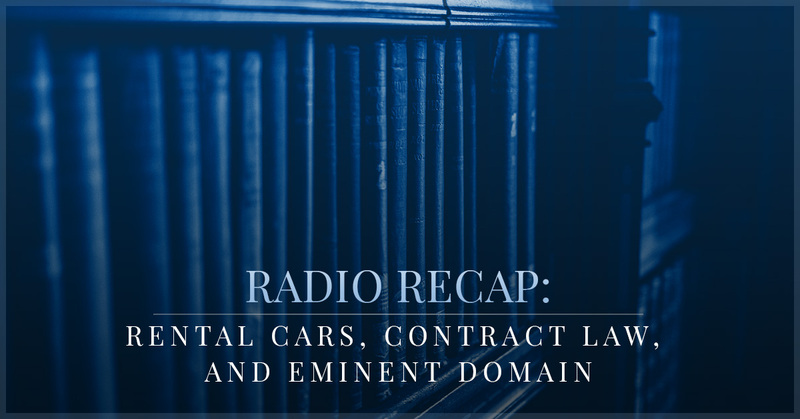 How are transmission rebuilds and medical malpractice similar? You have probably never connected the idea of rebuilding a car transmission to medical malpractice, and we hadn’t either until Mel from Saratoga called. Like Dave, Mel also had a question involving rental vehicles and warranties. Mel claims, however, that the dealership did not perform the correct maintenance the first time around, requiring him to undergo even more car repair. He is paying for a rental car, and he wonders what claim he might have against the mechanic shop. Daniel and Chris connect this situation to medical malpractice, where a doctor did not recognize and correct a medical issue of which they should have taken care. As with medical malpractice, the argument centers on negligence. Was the mechanic negligent in conducting repairs, and, if so, how do you prove this in the court of law? Daniel and Chris suggest that you can get another mechanic to serve as an expert, telling a judge what actions they would have taken in a similar scenario. They also mention going to a lawyer first to mediate the issue without the hassle of going into court. Compromise is always the first opportunity to seek, and settling out of court is usually a more predictable, lower-risk option. Between callers, Daniel asks Chris more questions about his appellate court experiences. As a New York litigation attorney, getting a case heard in front of the court of appeals is an impressive professional accomplishment. The New York Court of Appeals is the highest judicial body in the state, and it is extremely selective in the cases it chooses to hear; indeed, they only hear about 5 percent of cases they are asked to hear. Unlike medical malpractice suits or other civil litigation trials, appellate cases stand out because they involve such high-level arguments. Far more than making a ruling based on the law, appellate courts are interested in the law’s history, evolution, and interpretation. Chris ended up winning his case at The New York Court of Appeals which speaks to his legal acumen and the expertise of the Girvin & Ferlazzo law firm in Albany. The next caller, Peter from Albany, explains his situation as a one-man LLC. He completed a construction job about two years ago, and never billed the client for $6,000 of work. Recently, he sent the client an invoice and notice and they have not responded. Peter wonders if he can still lay claim to this money, or if he has waited too long to send an invoice. Daniel and Chris, based on the information Peter gave, suggest that he could go to Small Claims court if he wants to collect $5000 (the financial limit for Small Claims court) and not the total amount. Because there was an agreement and the client did not hold up their end of the contract (i.e. did not pay), Peter might have a good case for breach of contract. For the future, the two lawyers from Girvin & Ferlazzo recommend putting liens on properties to add another layer of protection against breaches of contract. Dan, the final caller of the day, asks about eminent domain and property rights. He inquires about locally owned real estate, a parking lot, which still has 29 years left on the lease. Does the agency enacting eminent domain have to pay off the lease? The first step, Daniel and Chris agree, involves checking the lease for a contingency clause about eminent domain. They also get into fair market value, and suggest that Dan can get the property appraised or do an income valuation if the property is income-producing. They emphasize that if Dan decides to hire legal help, any reputable law firm will first go through a cost-benefit analysis and be transparent about legal fees versus potential benefits. If you have legal questions, call the law office of Girvin & Ferlazzo for a consultation in Albany. You can also call into Talk 1300 on Saturdays at 10 AM during the Girvin & Ferlazzo law show!